If I want to talk on the phone while driving, I’ve got to carry a Bluetooth headset along with me and remember to keep it charged. If I want to listen to music from my phone in the car, I need to plug the phone into the speaker with a wire and control the music with the phone itself. Neither situation is optimal. Enter the Kinivo BTC450 Bluetooth Hands-Free Car Kit. The BTC450 consists of three components. The first is a power plug that goes in your car’s cigarette lighter. This provides power to the entire unit as well as giving you a USB port to charge your device. The second part is a plug that goes into your stereo’s auxiliary input. The third, and perhaps most important, component is a small button. This button might be small, but it is quite powerful. It connects to your smartphone via Bluetooth and routes audio from your phone to your car’s speaker system (via the aforementioned auxiliary input plug). It also acts as a microphone so the people you are talking to on the phone can hear you. Pressing the button can both begin or end a phone call. Finally, two small buttons on top allow you to skip ahead or go back while listening to music. No longer do you have to pick up your cell phone while driving (a very unsafe thing to do), just press the button. Of course, all of this wouldn’t be worth anything if the audio quality wasn’t good. In my testing, the audio coming from the speakers (routed from the BTC450) was very good. The people I called initially reported that I sounded muffled, but I repositioned the button/microphone and they said that I was coming in much clearer. The button comes with adhesive to affix it on your dashboard for easy access. I positioned it on a spot on my dashboard without the adhesive, but if you do stick it on, I’d recommend trying it out before using the adhesive. Overall, this was a very nice way of enabling Bluetooth access in my car. Considering that the BTC450 only costs $39.99 (affiliate link), it is quite an inexpensive method of adding Bluetooth to your car as well. This is definitely a device that will get plenty of use every time I go for a drive. 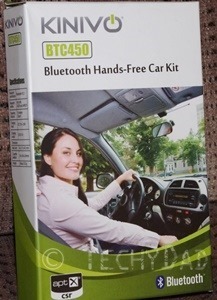 DISCLAIMER: I was sent a Kinivo BTC450 Bluetooth Hands-Free Car Kit to review. The opinions expressed above are my own. No compensation (other than the product) was provided. Nice product. It will help to listen to music easily. One can use the best car amplifiers. They are good. Car amplifier is a device that is used to amplify the audio signals. Some of them are the best. Planning fun during the weekend is a great thing with these products. One has to check good items.